It's not unusual for Nintendo to pull off strange publicity stunts, like turning Times Square into a Wii Sports resort park or dressing all their E3 booth staff in cat ears and instructing them to meow at attendees. 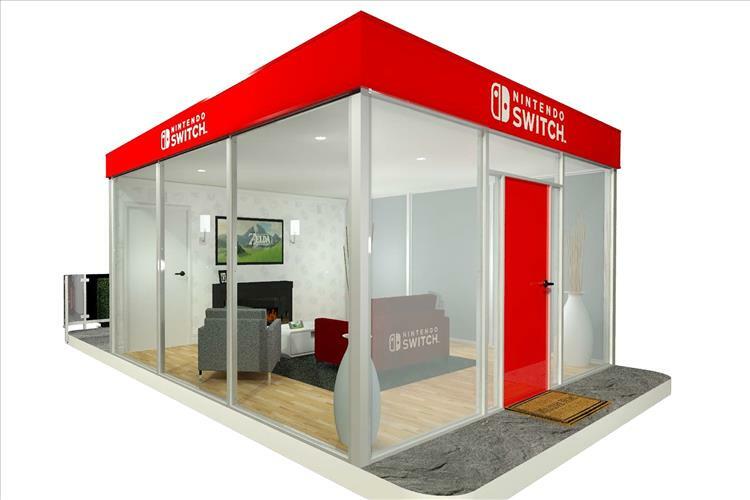 The "Switch and Play" tour is no different, with Nintendo setting up isolated living room-esque spaces in semi-remote locations to demo the Nintendo Switch. The first one is invite only and takes place at the Blue Cloud Movie Ranch in Santa Clarita, CA on February 23rd. To make things even more exciting (and weird? ), none other than John Cena will be on hand for that stop. The other two stops are in Snowmass Village, CO and Flatiron Plaza in New York. I get that Nintendo is pushing the whole "play anywhere" angle by holding these events at strange locations, but it just seems inconvenient to me. Nintendo still has an uphill battle to convince people that the frankly overpriced Switch, it's obnoxiously expensive accessories and thin launch lineup are worth the investment. In my opinion, single-day publicity stunts will just further confuse consumers. Hold week-long hands on demos at Best Buys across the country and you're likely to get a much better response. Check the press release after the jump for more details if you plan on attending either of the open events. REDMOND, Wash.--(BUSINESS WIRE)-- Imagine driving in the middle of the desert and seeing a couch, TV and video game system in the middle of nowhere, or skiing down the side of a mountain and seeing another one of these surprising setups sitting there in the snow, ready for a round of gaming. It’s a striking visual, sure, but it drives home the message of Nintendo Switch, Nintendo’s revolutionary new video game system that launches on March 3. Nintendo Switch is a home gaming system with the portability of a handheld. The system lets you take home video game experiences anywhere you go, offering you the freedom to play where, when and how you like. About Nintendo: The worldwide pioneer in the creation of interactive entertainment, Nintendo Co., Ltd., of Kyoto, Japan, manufactures and markets hardware and software for its Wii U™ and Wii™ home consoles, and Nintendo 3DS™and Nintendo DS™ families of portable systems. Since 1983, when it launched the Nintendo Entertainment System™, Nintendo has sold more than 4.4 billion video games and more than 696 million hardware units globally, including the current-generation Wii U, Nintendo 3DS and Nintendo 3DS XL, as well as the Game Boy™, Game Boy Advance, Nintendo DS, Nintendo DSi™ and Nintendo DSi XL™, Super NES™, Nintendo 64™, Nintendo GameCube™ and Wii systems. It has also created industry icons that have become well-known, household names such as Mario™, Donkey Kong™, Metroid™, Zelda™ and Pokémon™. A wholly owned subsidiary, Nintendo of America Inc., based in Redmond, Wash., serves as headquarters for Nintendo’s operations in the Western Hemisphere. For more information about Nintendo, please visit the company’s website at http://www.nintendo.com.